“In Port Lligat I take care of my orchard and my boat: in other words, of the canvas I am finishing; like a good worker, I covet simple things: eating grilled sardines and strolling with Gala along the beach at sunset and seeing how the Gothic rocks are transformed into nightmares by the darkness”. 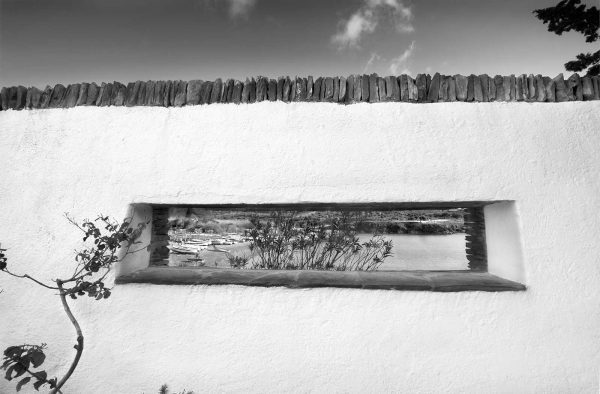 – Salvador Dalí Photographic Story As I walked around the patio, I noticed a window opening up, looking out over the bay of Port Lligat. As I saw the boats lined up, the view explained to me how important Dalí’s relationship was with the environment just outside his window. Digital – Archival Pigment Print This photograph was taken with a high-quality digital camera. The photograph is printed on an Epson Stylus 4800 or 11880 printer. Clyde uses archival Ultra-chrome K3 i and prints on archival Harman Hahnemuhle paper. The limited edition photograph is then mounted and matted to current archival standards. This is a limited edition series and each photograph is numbered.